Did you happen to find this site while searching for your Byrne ancestors? I’m glad you visited, but want to warn you up front there are very few Byrnes here. In fact, of the 4,500+ genealogical records on the site, only about 100 or so are Byrnes. The reason for the dearth of Byrnes on the site is that my line descends from an early American, John Byrne, born in Windham Connecticut in 1760. Efforts at tracing this line back to Ireland or otherwise have been fruitless to date. And there’s a wrinkle to the story in that John may not have been a Byrne at all. Genealogical DNA evidence shows that his line (or possibly his son, George) actually descend from lines tied to the Cole surname, and it’s likely that at some point in 18th century Connecticut a child fathered by a Cole was adopted by John and his wife, Ann Powers. So where to go if you’re looking for a comprehensive database of Byrnes? Aside from the usual spots (e.g. Ancestry.com, Familysearch.org, etc. ), Paul Burns has been leading an effort document and publish multiple Byrne/Byrnes/Burn lines via his DNA project. 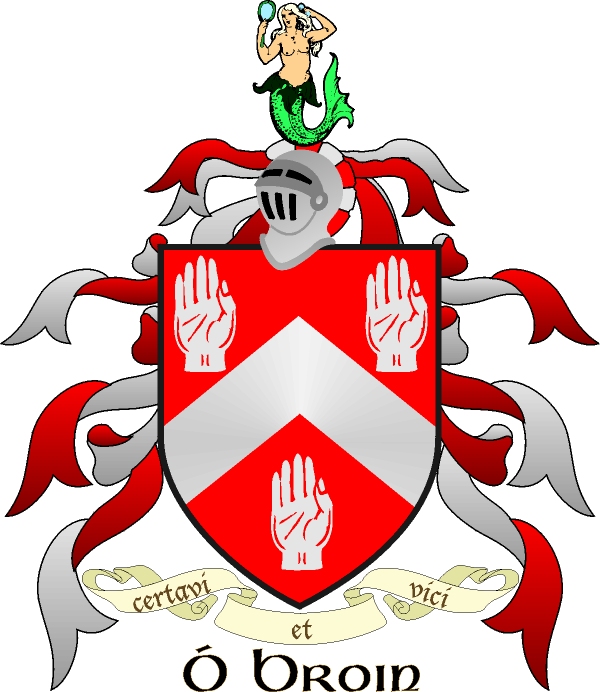 While not an uncommon name (although Byrne is not even in the top 1000 surnames in the US), it’s extremely popular in Ireland, ranking 7th in popularity, and you’d be well served to check in with the Byrne Clan right here, which focuses on Irish descendants. If you did happen across the site in search of info on John Byrne’s lines, or for that matter some of the other larger branches (Fernald, Asimov, Trapnell, Austin, Eby etc. ), please say hello. And for those on the hunt for other Byrnes, best of luck in your search. I want to send you the latest Cole-Byrne-Bentley yDNA chart. What’s your e-mail? The “Boston” line all has mutation at marker 413b. His son John married Susanna Hutchinson, a daughter of Anne (Marbury) Hutchinson who was thrown out of Boston and killed by indians in NY. I’d love to see it (sounds intriguing). Easiest address is the site address: [email protected]. I have a cousin (Thomas Garland) interested in the Garland ancestry in Scottsville, Virginia. How can he contact you? Thanks in advance for your assistance. Your research is AMAZING. The Garland research all comes via Wayne Garland. You can reach him at [email protected], or via the comment/feedback section on most of the pages here. Thanks for the info – I’ll use it to help my cousin find whatever resources wanted. I’m a direct descendant of John Byrne. See you family tree that leads to Dr. Charles Byrne, with sons Robert Byrne and Charles Byrne. I’m a son of Robert Byrne and have three brothers Richard, David, and William. I can add info to you tree Emma Cooper line and Mary Shank, wife of Dr. Charles Byrne. What I’ve been trying to do is find out info on Catherine Zeller. We have pictures of her with Mary ?Zeller(sister) and some of the Shanks. Ancestry .com seemed to have no info on the Zellers. I can give you other family info. Bill Cole had contacted me years ago about the DNA stuff. I also have boos and the desk that John Byrne printed and some of his tools. Recently I donated to the U of Conn Library several NP volume of the Windham Herald that John Byrne had printed. I have matched DNA with several Byrnes on 23&Me and FTDNA. They are all still in Ireland, and as I’m from people who came to US in the 1600s, I haven’t been able to trace back to Byrnes, and there are none in my immediate known pedigree. However, I came to this site and found Wingfields, Cosbys,Garlands and Carrs. I have a line back to all of these, so tucked in there somewhere is a Byrne for me. Interesting. There’s a pretty good body of information here on Garland, Cosby, and Carr lines, and less so on Byrnes (pretty much no information on lines in Ireland). Good luck in your research. I was born Rachel Charlesworth. I am the granddaughter of Delores Evelyn Byrne sister of Cptn. Wilbert Byrne children of Chester Philip Byrne & Eva Talbot; relatives of James & Edith Byrne; Nellie Johnson Byrne; Dorothy McKenzie McHugh…other family names Comegys, Noble, Branco & Worthington (not sure on the spellings). I have two sons Brett Richard Allen and Avi Matias Salas. I am sorting through a box of my grandmother’s letters & photos she left to my mother Sharon Kerley. I just found Captain Wilbert Byrne’s name on the Faces of Freedom 1941-1945; most of the letters are correspondence between Captain Red and my grandmother. I plan on putting them in order by date and making copies. I also plan to upload them to the internet so that they will be preserved forever in case anyone is ever interested. The letters are beautiful and the stories spectacular. I will post again when I have them together and ready to roll. I would love to send copies of them to the Byrne clan for the archives. My grandmother was an animal lover and there are pictures of her with all sorts of different animals even with her monkey. My maternal grandmother was Anne Byrne, daughter of Edward Byrne of Rossnowlagh, Co, Donegal. There were 14 living siblings, including my grandmother, so there are a few of the those Byrnes around. I am second generation American and still in contact with my cousins who still live in the same area in Ireland. My grandmother married Thomas Hunt who was also from Co. Donegal… Ballyshannon, I believe. She came to New York, he followed her, they were married here and had seven children. My mother was the youngest. I was looking up my birth mother, Frances Schneider from Woodland Beach, MD. My father was William Edward Oliver. I was their first child, Sherry Lee Oliver, born in Sibley hospital Washington DC, on April 3rd 1946. Also she had a son, William Edward Oliver junior. I believe Frances Schneider, who married Phillip Tomaselli, was my birth mother. I have documentation of this, in my birth certificate. Please contact me, I would like more information on my birth mother, for my children. Thank you. according to your presentation, my ggggg grandmother Elizabeth Garland’s second marriage was to Edward George Walpole, my 5g grandfather. Same info is given by Family Search, However, in Va, and in Lunenburg in that era was an Edward Goodknapp Walpole [who was kicked out of Ireland by his family] and who was a friend of the Garlands and who may have married Ann Chynn in Fauquier County. Were there 2 EGWS? And can you give me any sources for the Edward George Walpole designation? I’m also curious about Edward Walpole, who I can trace back to on my mother’s side. Here’s the line, if anyone is interested: Edward Walpole, Horace Walpole, James Legare Walpole, James Solomon Legare Walpole, James Legare Walpole, Orie Estelle Walpole (Hall), Orie Anna Hall (App), Kevin M. App (me). So Edward would be my 5G Grandfather on my mother’s side. Anyway, anyone come up with anything on where he came from and who his parents were? Some on my mother’s side have claimed a relation to Sir Robert Walpole (1st Prime Minister of Great Britain), but it appears that that couldn’t be correct, at least for someone carrying the Walpole name. As far as I can tell, Sir Robert had no male grand-children. Anyone? Dolores Evelyn Byrne is the correct spelling. I am a Garland.. My grandfather left Belfast Ireland in the early 1900 with is mother Catherine Breen Garland and settled in Rochester, NY On my mothers’ side my 4th great grandmother was Mary Bryne which I believe came from the Wiclow area.of Ireland. She and her husband John Roach settled in Hasting area of Ont Canada. Strange thing happened… My grandmother was a Byrne and she told the usual stories about Kings & queens of Ireland and I’ve always identified with being Irish. I read a lot. While researching the family name one day I noticed Bern Germany which took me to Switzerland to the Bear Goddess where I was stuck. Then one day I don’t know why I added a stein behind and that took me right back to Ireland. When I ask my mother if we’re Jewish she just laughs and says “you never know” and to “leave it alone”. It’s crazy! My mother was a Byrne, daughter of Walter and Mabel. I had a DNA test and large ancestry picture was 71% great Britain, 12% Ireland, 11% Europe West. More specific information indicated “west Asia”. Hi Janet. So glad you stopped by. As more people get DNA tests it gets really interesting reconciling the ‘recorded’ genealogy with the genetic reality. I’ve been researching some close DNA connections that have no common ancestors between our trees (or so it would appear). And our common ancestor, George Byrne, appears not to have been related to his father, John.